Lo! The corpse of poor, departed Scholar Zubayr, washed up on the shores of the River of Sand, lies in the charnel house…destined to become dinner for a cult of cannibals. Though distasteful in the extreme, this isn’t your concern—except that Princess Karima Gamila, the most beautiful gnoll in Per-Bastet, has begged you to rescue her friend’s body and help discover his fate. Still unmoved to action? Know then, adventurer, that the Scholar was hot on the trail of lost treasure! If you can claim his body from the cult and decipher the clues he left behind, long-buried riches and powerful magic might be yours. But nothing is simple in this city of dark wonders: others converge on the charnel house in pursuit of wealth, vengeance, or both. Can you out-fight and outwit vile cultists, undead catfolk, a cunning werecrocodile gnoll, and the deadly secrets that lie buried beneath the River of Sand? Grimalkin is an adventure for 3rd to 5th level characters and compatible with the 5th Edition of the world’s first roleplaying game. 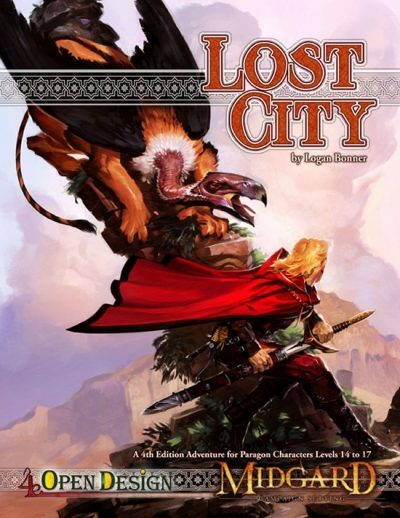 Set in the city of Per-Bastet in the Southlands Campaign Setting, it is meant for play either as the thrilling sequel to Cat and Mouse, or as a standalone treasure hunt! This supplement clocks in at 34 pages, 1 page front cover, 1 page SRD, 2 pages of advertisement, 1 page back cover, leaving us with 29 pages of content, so let’s take a look! So, the first thing you should know is that this module is set in the amazing, evocative city of Per-Bastet, within Midgard’s Southlands. If you haven’t checked out the amazing setting, you should do so. Secondly, this can be run as a sequel to “Cat & Mouse” or as a stand-alone adventure. 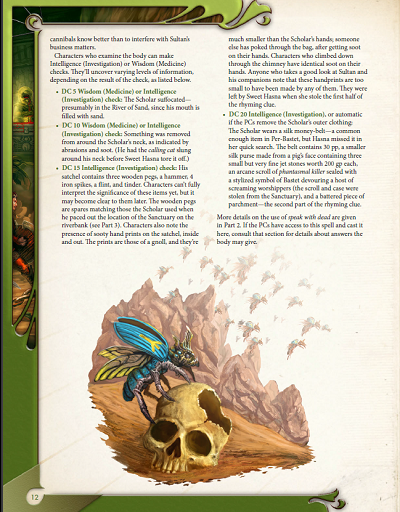 Now, this module works best when used in conjunction with Tome of Beasts; there are several creatures like the Anubian or the Temple Cat that refer to the Southlands Bestiary. This book, to my knowledge, is exclusively available as a PFRPG-supplement – but before you boo and hiss: All creatures mentioned by the pdf can be found in Tome of Beasts – only the reference is incorrect. 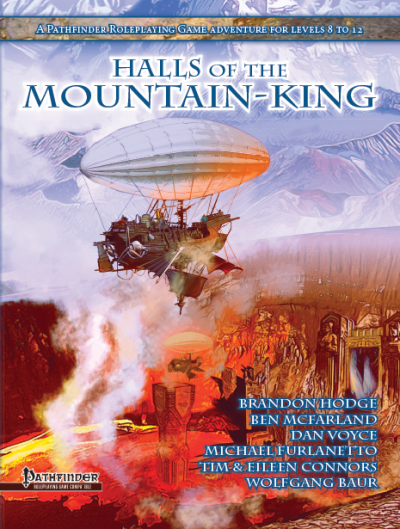 Still, I strongly suggest getting the excellent Tome of Beasts prior to running this; the adventure loses some of its appeal without the unique critters. Regarding formal criteria, the pdf sports detailed read-aloud text for you; organization-wise, important NPC names tend to be bolded and, for the most part, the more important skills etc. are highlighted, though here and there, the regular text does note skill uses and DCs. As such, I strongly suggest reading the module in its entirety before attempting to run it. The adventure sports several really nice full-color maps, but alas, we don’t get any player-friendly versions sans secret doors and keys, and not all of them take up a whole page. The maps may require a bit of tinkering if you attempt to run this via VTTs etc. and honestly, I don’t get why we can’t get keyless versions. All right, so that’s what this is about, structure-wise…but we know that this is a module…and in order to properly discuss it, I will now go into serious SPOILER-territory. Potential players should jump to the conclusion. All right, only GMs around? Great! So, remember that weird Grimalkin Eye from Cat & Mouse? How its ability to control cats made it a rather potent and dangerous object in Per-Bastet? Well, where there’s an eye…there usually is a body, right? She may be a gnoll, but that does not mean that “Princess” Karima Gamilla is dumb…and thus, she sent out her feelers. The gnoll princess turns out to be a rather sophisticated individual, and she sports two different entry vectors to secure the services of the PCs – she really wants to talk to the body of a deceased man to help her ascertain the truth of the current, shadowy situation. While she has no lack of lovesick cronies at her disposal, she does have a preference for less foolish individuals, for professionals – in short, for the PCs. Kudos here: Beyond the two angles to convince the PCs, the module does sport a nice sidebar for troubleshooting particularly suspicious or undiplomatic PCs. In the aftermath, the PCs will have to navigate the field of tensions between these factions…for it turns out that the deceased scholar had the first part of a rhyming key in ancient Nurian. Things become more complicated still, as undead creatures are tracking a particular feline statue – the calling cat Smart PCs may use this beacon of sorts as a weapon, for Abdul-Haqq does have the second part of the rhyme that the PCs will want. And yes, he is not a pushover. Turns out that he is actually a were-crocodile…and, well…and unpleasant being. His HQ is once more fully mapped, though I did wish we actually got a player-friendly version of the full-color map. This free-form chapter obviously also means that it can go a lot of different ways, depending on the behavior of the PCs and whom they trust or don’t trust. 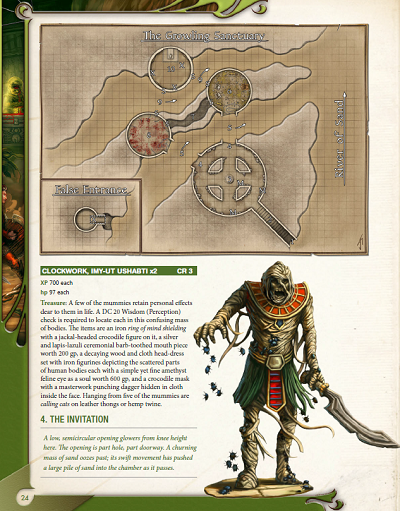 Huge plus: The rhyming key’s translation has actually been included in the pdf and makes for a cool piece that the PCs can recite…and the key actually also holds the truth of the location of the growling sanctuary…which also is sanctified to a rather grisly heresy of Bastet’s teachings. And yes, PCs with only one part of the riddle/rhyme will well find a false entrance… Anyway, the finale has the PCs explore a unique locale dungeon, with the river of sand growling and unique individuals and creatures attempting to defend the sanctuary…which also contains the mighty Grimalkin idol – if the PCs can secure it, they may have the tools to ingratiate themselves to the authorities…or all manner of unsavory beings looking for a means to grab for power. 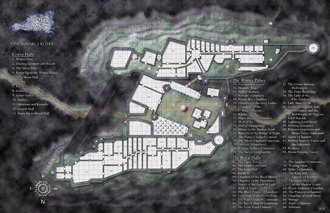 It should be noted that the dungeon makes good use of global effects – undead are bolstered, the raging river of sand is loud – all in all, a great little dungeon….and the aftermath of the adventure sports a TON of different options for the GM to further develop. As a final, nice bonus, the module suggests an alternate final boss battle for particularly potent PCs. Kudos! Editing and formatting as a whole, are very good –apart from the erroneous references, I noticed no undue accumulation of hiccups. Layout is gorgeous, full-color, and adheres to a 2-column standard. 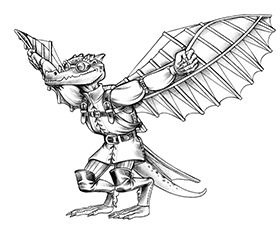 The full-color artworks are great and really high-quality, though fans of Kobold Press may be familiar with a few of them. The cartography is full-color and gorgeous, though I wished we actually got player-friendly versions of the maps; having keyless version to print out and use as handouts or for VTT-uses would have added further to the adventure. The module comes fully bookmarked for your convenience. Richard Pett and Greg Marks provide an impressive sequel to the atmospheric and fun “Cat & Mouse” – the module breathes the spirit of 1001 nights, with the unique atmosphere of Midgard’s evocative Southlands spliced in. In short: This adventure is extremely atmospheric and further develops the inspiring metropolis of Per-Bastet; I honestly would love to see a further sequel to this series, and I wholeheartedly believe that this city could carry a whole campaign worthy of adventures. 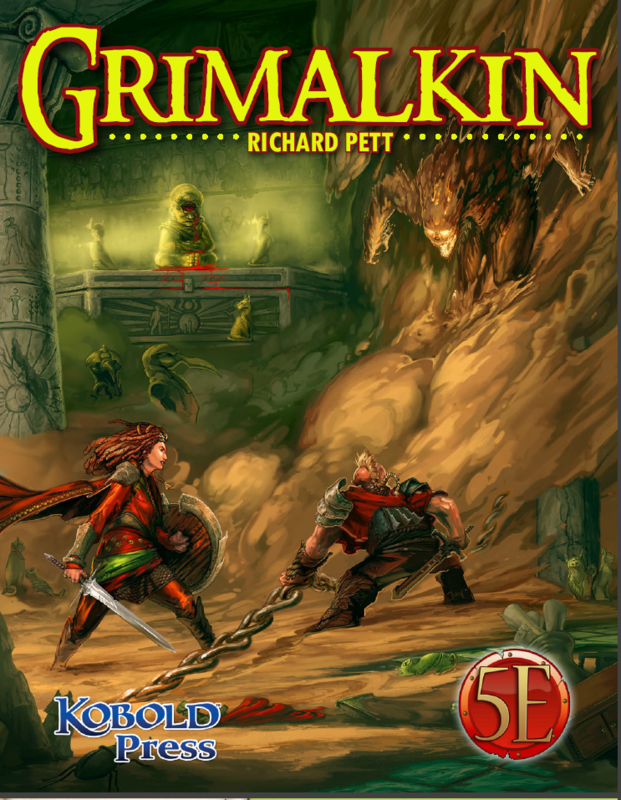 Grimalkin, in short, is a nice adventure full of quirky and intriguing characters and adversaries; the focus on intrigue and player-agenda make it versatile and interesting – also for the GM. There are quite a few aspects that can run in rather different ways, making this a well-crafted scenario with above average replay-value – all due to the emphasis of player-choice and roleplaying throughout the majority of the adventure. 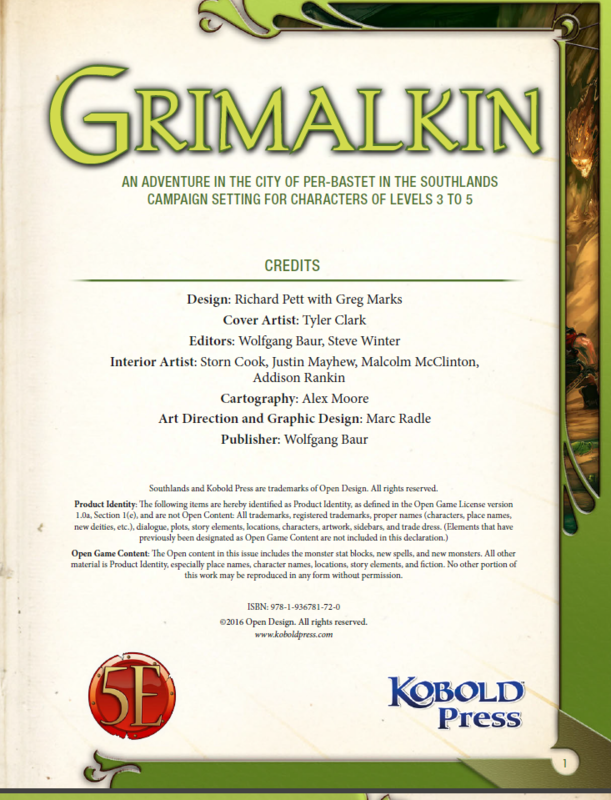 Grimalkin, in a nutshell, is a well-crafted, really fun adventure. The minor hiccups regarding creature-references and the lack of player-friendly maps are the only blemishes on a fun module. My final verdict will hence clock in at 5 stars.